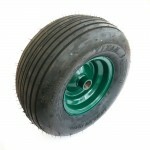 I have a small quantity of these wheels, which were originally obtained for golf buggy development. The wheels comprise of a pneumatic tubeless rubber turf tyre on a steel driven hub. The steel hub has a bore of 1" (25mm) and has a hole on the valve side for a 8mm drive bolt / pin. 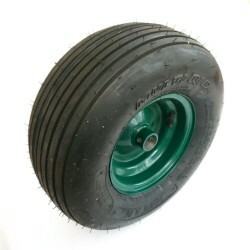 The wheels are a few years old, in unused condition, save a few scuff marks on the hubs. Important Information - This wheel must not be used on the road / highway.